As existing fossil fuel reserves have become unviable or unreliable, the challenge of providing a secure energy supply for power generation within the UK has increased significantly in terms of both financial and environmental cost. At the same time, landfills lack the capacity to handle the increasing amount of household and municipal waste. While efforts to reduce, re-use, or recycle waste have made some headway, other options have had to be explored. One such effort underway that is making a valuable contribution toward providing a balanced and secure energy portfolio for the UK involves the extraction of energy from residual (non-recyclable) waste. Lakeside EFW Ltd. operates an EFW (energy from waste) facility near London that is staffed by experts in energy recovery technologies who are working hard to ensure the plant remains efficient, technologically up to date, and above all, safe. The plant has the capacity to consume 410,000 tons of household and municipal waste per year and exports at least 34 MW per hour to the country's National Grid. This process diverts the majority (over 97%) of waste from landfill. Lakeside EFW uses a mass-burn process to generate high temperature that is then used to produce high pressure steam. The steam in turn drives a turbine to produce electricity. Residues and flue gases are carefully treated to minimize the release of environmental pollutants. The facility operates under strict environmental controls, within the guidelines of the waste incineration directive (WID) and an environmental permit administered by the environment agency. 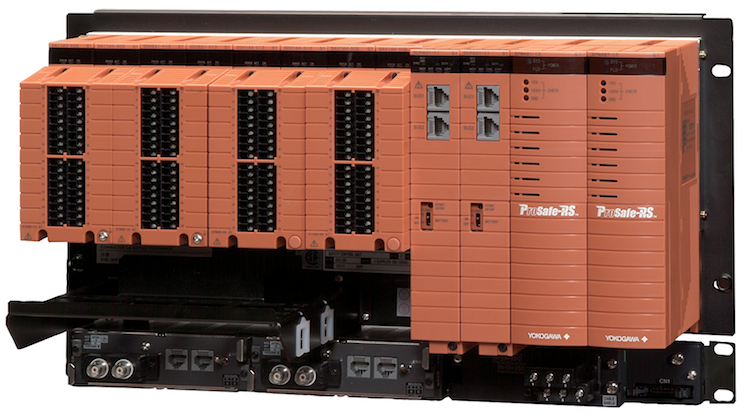 For Lakeside EFW, Yokogawa UK installed a CENTUM CS 3000 distributed control system and a ProSafe-RS safety instrumented system to automate control of the facility's boilers, burners, and balance of plant facilities. 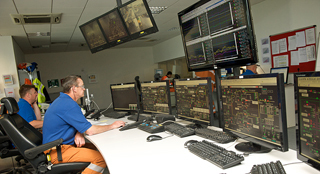 The facility has operated safely with no major system failures since coming online in 2008. Lakeside EFW is continually looking for ways to operate this incineration facility more efficiently. Waste is trucked to the facility, with the vehicles being weighed on entry into the site and again on exit to calculate the amount of delivered waste. Grab cranes mix the waste in a 7,500 ton capacity bunker to obtain a more controllable calorific value, then load the waste into a hopper from where it is pushed into the incinerator by hydraulic rams. The initial firing of the boiler is achieved using an approved low sulfur diesel. Once the waste is burning inside the incinerator, the diesel burners are switched off and the waste becomes the fuel. Superheated, dry steam created from the boiler process is used to drive a steam turbine, which in turn drives a generator set. The generator produces enough electricity to power the Lakeside facility and export 34 MW onto the National Grid. Spent steam from the turbine is condensed and pumped back to the boiler, making a closed-loop steam/water circuit. The facility has also been designed so that off-site district heating (combined heat & power - CHP) can be provided to local consumers in the future. The bottom ash from the waste incineration process is transported by moving belts to dedicated bunkers. Ferrous metals are removed from the bottom ash for recycling. The ash is removed from the site and processed into an approved aggregate material for road building and construction. The hot gases from the incineration process that were used to heat the water contain various compounds and chemicals that need to be treated. These gases and chemicals are cleaned in a flue gas treatment process. This uses slaked lime to absorb sulfur gases and HCL. Activated carbon to absorb dioxins and heavy metals, and ammonia to reduce NOx gases. The air is subsequently passed through a bag filter before it is released from the stacks. The emissions are monitored in real time using state of the art, independently calibrated measuring instruments to ensure compliance with permitted emissions limits. 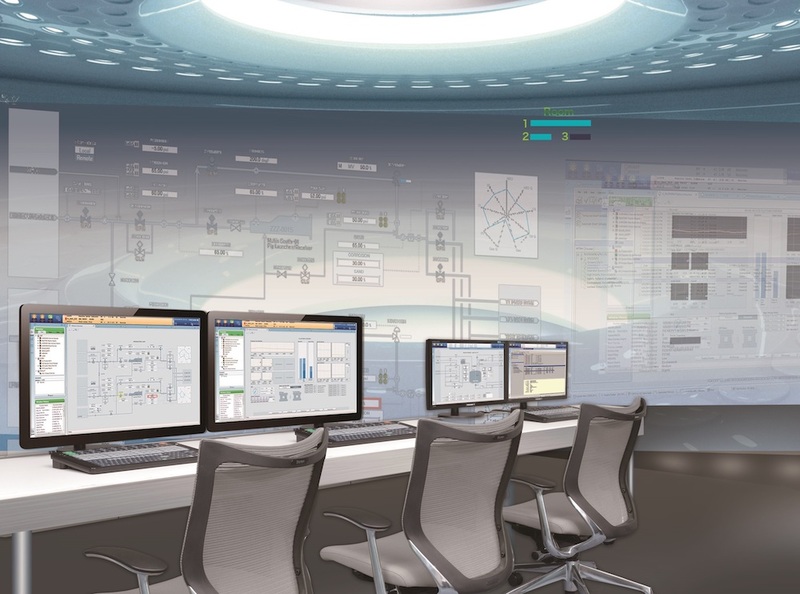 With the integration of the Yokogawa CENTUM CS 3000 and ProSafe-RS systems, operators in the central control room enjoy ready access to operations throughout the plant. Ergonomically designed CS 3000 human interface stations (HIS) provide a window into all of this facility's processes, giving operators real-time access to all the information they need to make quick and timely decisions. Everyone at Lakeside EFW is pleased with the high reliability of the Yokogawa systems and their ease of operation and engineering. The new plant was designed to meet the requirements of the European Waste Incineration Directive, which mandates tight controls on the atmospheric release of dioxins, heavy metals, acid gases, nitrogen oxides, particulates, and other products of the combustion process. This reduces environmental impact and protects human health, and the facility's emissions of dioxins and other health related pollutants are low compared to common air pollution sources such as outdoor burning and vehicle exhaust. Lakeside EFW well recognizes the importance of water conservation and has designed the facility so that all process water and water from maintenance activities is collected in a tank to be reused as "grey" water for non-critical purposes. 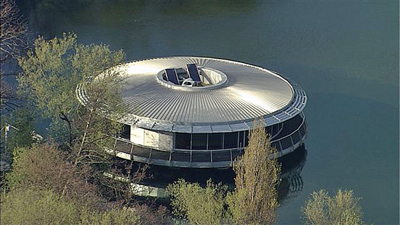 The company has built an education center that extends out over a nearby lake. This is used to educate the public on the efforts that Lakeside EFW is making toward a sustainable future.